Carrtog, landless third son of Tsingallik and warrior trained in the use of powder magic, intends to make his way as a mercenary for hire. On his travels north, he and his personal guardsman stumble upon the royal christening of an expansion to Cragmor’s burgeoning railway –– in this case a gift from the King as a sign of goodwill to the conquered north of old. When the gathered populace prove they are not there to be pacified, Carrtog isn’t about to standby and do nothing. Cloaks sweep back, swords and pistols are drawn. Luckily for Carrtog, charging in might be his best chance of earning a name. But then the trap springs around the royal party and Carrtog realizes his eagerness may lead to his demise. Worse, if he manages to survive the ensorcelled contraption and rescue the King from the depths of the rebellious north, he might find that holding the King’s favor could prove more dangerous than any duel against a combat magician in the haze of battlefield smoke. He’ll need more than a little wit and inventiveness to survive this uprising. 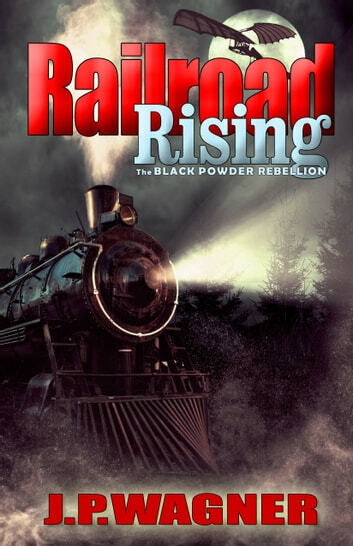 Steam engines, railway lines, gunpowder magic, and the advent of flight merge this flintlock fantasy adventure with the well tested machinations of steampunk –– a true confluence of invention and rebellion.